The first outing of The BlogAdda Weekly dealt with a topic that many of us relate to in the safe confines of our rooms and minds, but refuse to even acknowledge out in the open. Depression – an issue that still remains a lullaby filled with painful stories recited to tear streaked pillows during the midnight hours. As growing awareness throws some much needed light on the worrisome statistics and the dire need to speak up on mental illnesses, acceptance and treatment seems to be the only soothing agent for those who are suffering. While the prevalence of depression may be a cause to ring alarm bells, hearing inspiring stories by those who battled this problem, took charge of their own life and emerged victorious makes us hold on to hope for the future. 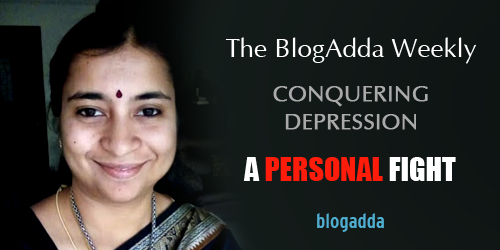 We end our series on Conquering Depression with a truly inspiring and personal post by Shailaja Vishwanath, who battled depression with the constant support of her family, and now leads other people from the darkness into the light. Shailaja shares her life lessons on parenting through her blog Diary of a Doting Mom. You can also stumble upon her short stories, poetry and writing tips at The Moving Quill. Post depression, she found her solace in blogging and writing on depression through social platforms. She is currently working on her memoirs dealing with depression and graciously let us have a glance at her victory over her mental illness. “Depression, bipolar disorder, schizophrenia- these were terms that were vaguely familiar to me as a student of Psychology back in 1998, three years before I myself fell victim to the insidious vice of mental illness that threatened to rip apart my family and brought me to the brink of suicide. Back then it was just a bunch of words on paper. Experiencing it all, however, was a wholly different ball game. The wrenching pain, the agony of not knowing what was going on, the constant guilt and self-blame were all too much for me to take. It took the intervention of my parents and with the cooperation of my husband, we approached therapists and psychiatrists seeking a cure. People ask me about the symptoms I felt and I have spoken about most of them in detail in my current work in progress. The point is, though, there are no standard set of symptoms that will necessarily set apart victims of mental illness as opposed to everyone else. It takes an extreme behavioural reaction at times, for the illness to manifest in public. Most times, it stays under wraps, undetected, unresolved and shamed by society. Insomnia, suicidal tendencies, hallucinations, extreme and violent mood swings all punctuated my bipolar phase. Singing, reading, writing, speaking to friends and family- everything I loved became not just difficult but positively impossible to execute. What helped me recover is multi-fold. From the best therapist to the best of care, I bless everything that happened to me. I couldn’t have asked for a more supportive husband who stood by me through the months of uncertainty, when even I wasn’t sure if I would recover. My parents pulled out all the stops and not once did my dad flinch when telling people that I was mentally unwell and needed time to recover. It takes courage to stand by your decisions and I feel grateful that I have a family that believes in that principle 100%. Depression changed me, in obvious ways, of course. Soon after recovery it became difficult for me to trust people, open up or speak up the way I used to before the illness. With time and dedicated support, though, these things became a thing of the past. But it also changed me in more subtle ways. Writing and blogging about it helped me tremendously and speaking up on social media, continuing to address the issue of Mental Health, is something I strive to do passionately even today. I’ve always tried to give people the benefit of the doubt in any situation and now, post depression, that sense has been sharpened even further, if I do say so myself. Ever since I wrote a single post over a year ago, talking about my illness, the wave of reactions has been both comforting and overwhelming. On the one hand I am grateful for the support that’s poured in. There are more people speaking up than ever before thanks to celebrities shining a spotlight on the issue and mental health may finally be getting its due in the public domain. On the other hand, there has been some backlash, a bit of unpleasantness online and scorn too that people with mental illness aren’t really sick- not like they have Cancer or AIDS- and the assumption that we’re doing this for the publicity. Coming straight from a soul who despite the hurdles and wrath of the mind, sprung back to life, not once bowing down to the deadly disease, the story leaves us open to the vastness of hope and conviction about the arduous, but a very traversable road to recovery. While we’re just the messenger for this message of hope about depression, BlogAdda along with Dr. Vipul Rastogi and Dr. Vasant K. Mundra who shared their their expert opinions and Shailaja Vishwanath who wrote an inspiring account, hopes that it managed to create a difference in the lives of those who fight depression on a daily basis all alone, imbibing faith that there is a way out; all you need is to knock on the right door. Share your thoughts about this series in the comments below. We’ll see you soon with the next edition of The BlogAdda Weekly. Stay tuned! My experience with depression has been the other extreme, no recovery so far and no support system.Social and family apathy makes it a very different battle than that of Shailaja’s.All my other posts other than the one I wrote about depression received responses,indicating nobody cares. 1st Chapter of Bhagavad Gita is named. Arjuna Visadha Yoga. Ie when Arjuna gets possessed with regret, confusion, fuzzy thinking, depressive behaviour, whatever you want to call. Thanks B Anantha Bhat for your comment. That’s an interesting analogy to make. Thank you for the feature, Blog Adda. Pooja, so sorry to hear that. Therapy will help tremendously. I do hope you have explored that option first. I shared my story after 13 years on social media and on the blog. Before that I didn’t speak up for fear of rejection and lack of empathy. It’s been a tough call but it’s finally paying dividends. Anantha, thank you! That’s an interesting view. Although, I would categorise Arjuna as not being depressive but undecided. Absolutely true what you said about depression making us think about the situations of other people, we become less judgmental, more compassionate cos we know what it’s like to have an invisible illness. The scorn is what saddens me the most though; as in how people say “it’s not a big deal”. They should be thankful they don’t know what it’s like; that’s all I’ll say. So glad to read you, Shailaja. I had read your post last year and I’m am astounded by the courage and sheer passion you show towards addressing depression. I for one, know for sure that they are not trying for publicity or attention and it saddens to know that people misinterpret thus.